So the time has finally come for us green redramekin-ers to take the plunge and participate....yes, you guessed it...in a food blogging event. For those uninitiated into the ways of the professional food blogger, suffice it to say that there are lots of food blogging events. The premise is this: a blogger "hosts" an event by challenging other bloggers to create a special dish/photograph/recipe/etc. Many events are regular affairs that happen once a month or once a week. This post is a submission for the "Waiter, There's Something in My..." event, which happens each month and features a new twist on a standard dish. This month's standard dish was salad, so we were in luck. Last month, the dish was terrine. Yikes. Glad we didn't attempt that one. For more information on the event, head over to Spittoon Extra. But back to our submission. I sure do love a good salad, and I was happy to have the chance to test out this new recipe idea. 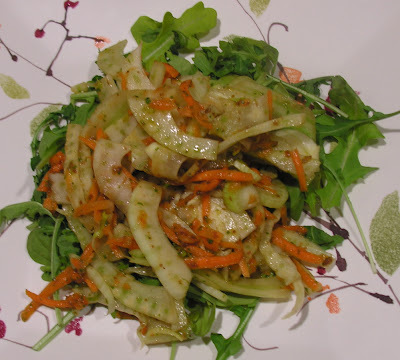 The salad is a carrot and fennel slaw type of deal, with a dressing that is bursting with all sorts of crazy Middle Eastern flavors. It is inspired by a more traditional carrot and raisin salad, but instead of chunks of raisins, this baby blends them up in the dressing, so the sweetness is a bit more even and subtle in each lovely, lovely bite. Have I mentioned that I'm completely in love with fennel? Well, I am. Fennel is my valentine. And I really love these crispy, slaw-y types of salads with a hearty meal. We had this one with a chicken, squash, and apricot tagine (recipe coming soon, I hope), and the salad was the perfect crunchy counter to all of that deliciously stew-like goodness. We happened to not have any fresh herbs on hand (mint or parsley would have been ideal), so I tossed a handful of arugula into the processor along with the other dressing ingredients. 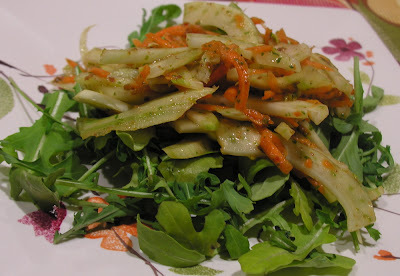 Arugula is spicy and herby enough to do the trick, although next time I'll be sure to try it with parsley. Also, make sure to make enough for leftovers...after sitting for a day, the carrot and fennel really soak up the flavors of the dressing. To make the dressing: soak raisins in hot water until plump and soft, about 30min. Drain and put into the bowl of a food processor. Add lemon juice, honey, and oil, and process until smooth. Add a handful of fresh herbs and process again. Pour mixture into another bowl, and season with salt, pepper, cumin, and cinnamon to taste. Add more honey if necessary. For the vegetables: peel and trim carrots and trim fennel (I suppose you could use the fronds for the dressing...). Grate carrots using the grating blade of the food processor, and slice fennel as thinly as possible, using the slicing blade. Toss vegetables and dressing together in a big bowl and serve either on a bed of greens or on its own. fennel - not somethign I really ike that much but perhaps the combination you suggest would make it more palatable to me!